Well this was a rather relaxing weekend for both of us, gardening and cleaning up around the yard etc. 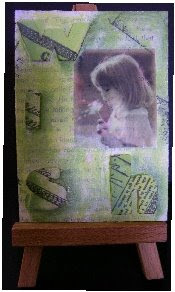 In the evenings I took to my Bernie Berlin book and looked over her tut on the use of fun foam on ATC's. So here are 3 cards that I did. I first got a font off a program from my computer and just wanted the outline, then I placed the fun foam in my printer and printed off the letters. Then I cut the letters our with some small scissors, man fun foam is like trying to slice butter in this humidity, very easy and soft, oh I just used a tan coloured piece of fun foam because I was going to be painting it anyways. 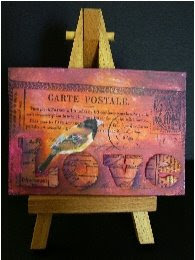 I then took some old paper from a printed magazine and used gel medium to adhere it to my base card. I then glued the letters on the paper and gessoed over the whole thing. I let this dry overnight. I didn't want to rush the drying process by using the heat gun. I had a few other things on the go and it is well worth the time to wait for it to dry. then I chose a colour scheme for each card and painted the backgrounds. The only thing I did different for the love card was I did not use a printed page on the base card, I just gessoed on the cardboard first. 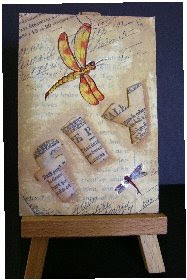 I got pics and used rub on Dragon flies for the " fly" card. After the paint dried I was just going to leave the letters plain but then I was given a Post Card stamp from a good friend and stamped on the cards and making sure I got it on the letters. OOOO loverly I say. These will be going up for trade. I haven't decided if I am keeping the Love one or not. I truly love that card. My friend Jen got me hooked on using Purple, orange and pink. Love the dramatic results. My next post is going to be a Giveaway but you might have to work for it. Les these are amazing and something i will definatley have to try........and of course you know which one i want!! Love these how they turned out. can see why you wouldn't want to trade that one.. maybe in time..